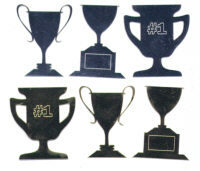 6 trophies in 3 different designs. 5cm tall, cut from gold and silver mirri card. Perfect for a Father's Day card.